Girls in the cafeteria. Author unknown, Lake Forest College Yearbook, 1982. 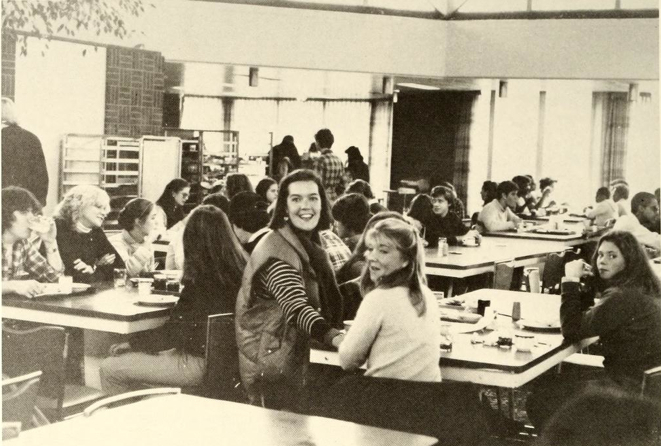 The cafeteria during the 1980’s was the popular place for all students to gather during their busy days. The food during the time holds no comparison to present day, but it was sufficient enough for the students at the time. This photograph from the yearbook displays two girls in the cafeteria. Today, this same scenario occurs in the cafeteria every single day. When walking into the cafeteria in 2012, groups of friends are everywhere in the room. It is a wonderful place for students to catch up with one another before heading off to class.